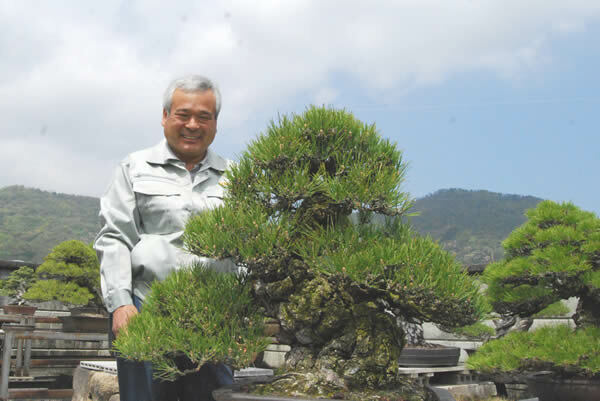 The fourth owner of the Kandaka Shojuen bonsai garden, Keiji Kandaka, grew up under his father Fujiyoshi's tutelage. ''It was completely natural in those days for a son to take over his father's bonsai business. Even in my childhood, I was well aware that I would grow bonsai trees in the future,'' Kandaka said. After studying garden design and acquiring expertise at the Tokyo University of Agriculture, Kandaka returned home. He has managed the bonsai garden since then. Keiji Kandaka smiles besides his bonsai products. Kuromatsu (Japanese black pine), Goyomatsu (Japanese white pine), and Nishikimatsu (Japanese brocade pine), which are the most traditional bonsai materials, are the main products of the Kandaka Shojuen bonsai garden. Kandaka handles a variety of other bonsai materials, such as zoki deciduous trees and shohin small bonsai pieces. On the other hand, Kandaka is pursuing the jissei technique that grows trees and plants from seeds. ''Jissei is much more troublesome than tsugiki (grafting). Jissei is attractive because it can turn out many more products,'' Kandaka said. A large number of 10-year-old kuromatsu trees grown from seeds are on the shelves for cultivation at his bonsai garden. A number of kuromatsu (Japanese black pine) trees grown from seeds are on shelves at Kandaka Shojuen bonsai garden. While managing the bonsai garden, Kandaka is aggressively working to improve his judgment and skills and to take in something new. He has shifted from conventional catalog-based mail-order sales to Internet-based sales. Kandaka participated in the second Taikan-ten bonsai exposition in Kyoto in 1992 for the first time. He has since continued to exhibit his products at the Taikan-ten exhibition -- the biggest to be held in western Japan -- and has deepened exchanges with bonsai lovers from across the country. ''Only superb masterpieces are put on display at this kind of exhibition. The high level of bonsai on display overwhelms me, but I can learn much there,'' Kandaka said. He has won a reputation for the expertise and judgment he has built up while learning from other experts. Discussing the future of Japan's bonsai culture, Kandaka has high expectations for the younger generation of growers who have succeeded to the region's traditions. Kandaka said, ''I hope my son will succeed me some day. But he is still studying at university. I don't know what will happen.'' His son has chosen foreign studies at university, expecting that bonsai culture will become internationalized.